A full package of 1500HP oil drilling rig mud solids control system package will be ready for delivery this week. GN Solids Control assembly the whole system for final running test and inspection. After that, all processing equipment and guardrails will be removed from the system for packing, and delivery to sea port for sailing to customer from Indian. The system does only content of 1 set of processing tank, but including following full line solids control equipment. The other suction tanks, mixing tanks, storage tanks will be built locally. It can save shipping cost and shorten the total delivery time. Firstly, there is a mud gas separation, model GNZYQ1000. The mud gas separate will be connected to client’s choke manifolds and to remove the gas for safety. And then 3 sets linear motion shale shaker are equipped for the 1rst stage solids control processing. 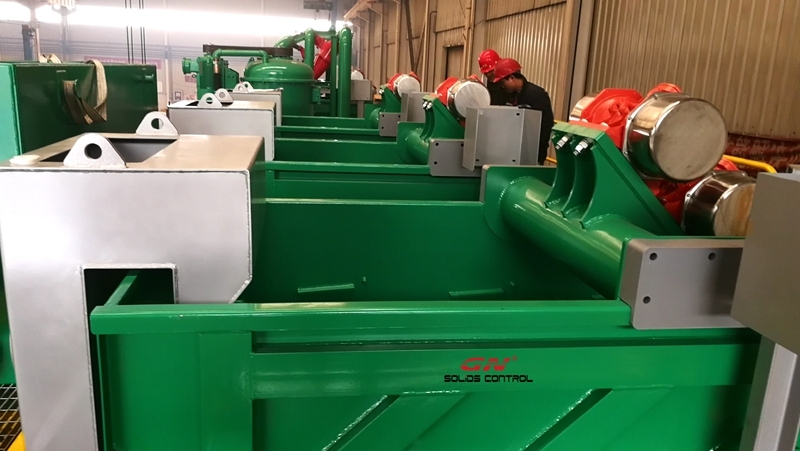 The shaker model is GNZS703F-HB, 3-panel shale shaker equipment with composite material shaker screens for longer lifetime, and with back type feeding box. 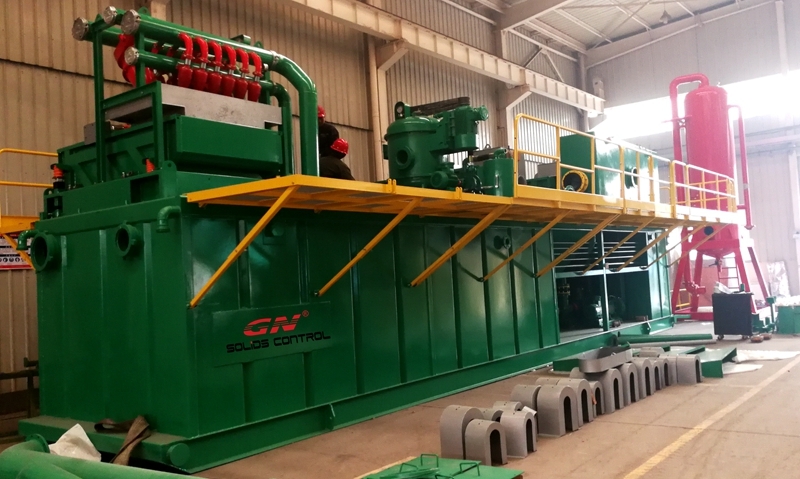 1 set of GNZCQ360B large vacuum degasser is equipped after the 3 shale shakers. It is used to kill the fine gas bubbles before enter into mud cleaner in order to protect the hydro cyclone separator. After vacuum degasser, there is a set of GNZJ703F-2S12N mud cleaner. It is a 3-1 separator for the 2nd and the 3rd separation. The mud cleaner is combined of a same model 3-panelshale shaker, 2 ea desander cyclones and 12 ea desilter cyclones. The desander and desilter cyclones will be fed by 2 ea 75hp centrifugal pumps. Futher more, a 11kw trip pump is located in the system. A set of EX control system is with controls for all mentioned equipment. GN Solids Control is also a leading screen manufacturer. GN can offer high quality replacement screens to customers for both GN own design shale shakers or other popular brand shale shakers.